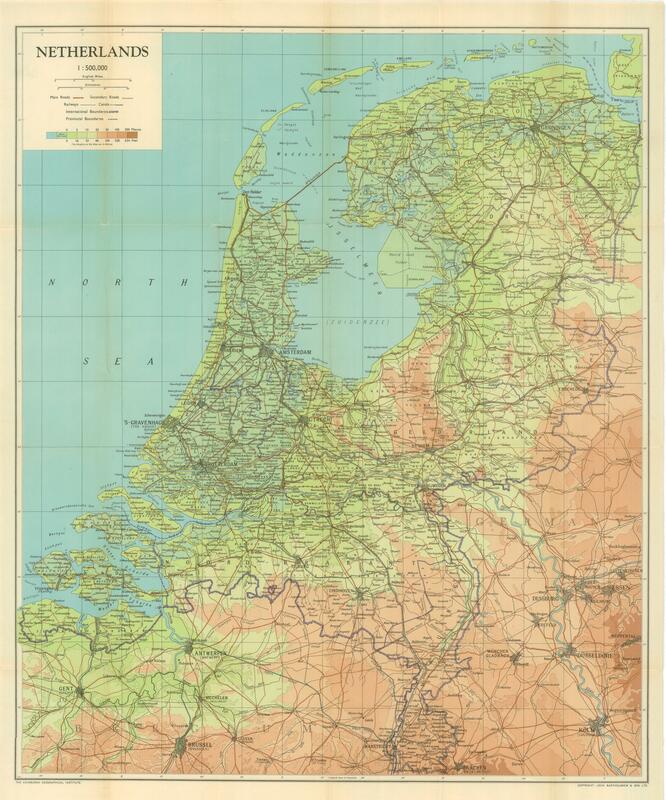 My thanks to Collins Bartholomew Ltd. for permission to reproduce their copyrighted 1944 map of The Netherlands. It was originally published by John Bartholomew & Son Ltd Edinburgh, probably around 1944. It was found in a pocket on the inside back cover of the book, Netherlands, published by Naval Intelligence Division, Geographical Handbook Series, October 1944. To view the map in greater detail, click on it once, then click on it a second time. The second click will provide a highly detailed view. Using your mouse, you should be able to scroll up and down on the map and drag it from side to side. If you follow the line labeled “30′” that passes through Middleburg and Bergen-op-Zoom on the west edge of the map to the point where it is just south of Tilburg, you can see the communities of Baarle-Nassau/Baarle-Hertog, Goirle, Hilvarenbeek, and Esbeek from which members of the Smit-Van der Heijden Line guided escaped French POWs, Dutch Jews, Engelandvaarders, and Allied airmen across the border to Brussels via Turnhout and Antwerp. For a link to additional maps of The Netherlands, click here.